No, no, no… this is not signaling a comeback by the great Major League Catcher with the same name, though the world could definitely use more of a mustache like his ("Mike Piazza Mustache"... Google it!... you're welcome). This Piazza, however, is just as burly, fashionable, and built for the big stage as the Hall-of-Fame ballplayer… and it is here just in time for the coming of the cooler months. The new REV’IT! Piazza 2 Jacket is going to be a great option for the commuter and scooter crowd. With a polywool twill 2L outer shell and detachable thermal liner, it is designed for cool weather riding. While it will not provide the highest degree of abrasion resistance at highway speeds, the Knox CE protection at the shoulders and elbows, as well as the ability to take a Seesoft CE-level 2 back protector (type RV) afford ample protection should a fall happen around town. 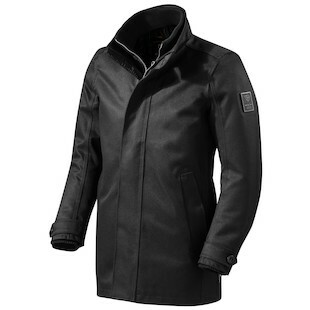 Additionally a hydratex liner that has been laminated to the outer shell creates the unique ability to have a completely water resistant wool jacket. If you are a city commuter who is looking to stay warm, stylish, and fashionable on your daily ride around town, groom that mustache, and then throw on the REV’IT! Piazza 2.